Amenity Home offers lovely, eco-friendly products for modern living, including the new Muir bedroom furniture collection. The pieces are inspired by classic modernist design and hand crafted from vintage hardwood rescued from buildings slated for demolition. Amenity's textiles coordinate beautifully with their furniture line, and now you can win some for yourself! Amenity is giving away a matching set of two 18x18 pillows (valued at $140 or more) in one of the colorways above: 1) Moss Birdseye 2) Charcoal Birdseye 3) Silver Trail 4) Moss Trail 5) Charcoal River 6) Sienna River. Just leave a comment on this post with your choice of design by Friday, March 26 at midnight CDT. Be sure to include a link or other way to contact you. One winner will be drawn randomly, contacted, and announced in this post. Update: Giveaway is now closed. Congrats to commenter #796, Brooke! To thank everyone for participating, Amenity Home would like to offer you a 20% off discount. If you sign up for their newsletter on their website, you'll receive an email with a discount code. Enjoy! Wooh oo - these are gorgeous! I like the "moss trail"- so pretty! Oh, I love them all! But moss trail might be my favorite! I love the green & white (4)! Thanks for the giveaway! I would love 5) Charcoal River! Gorgeous. Beautiful Pillows! I like Moss Trail Would go beautifully on our new couch. oooh i LOVE the charcoal river! Thank you for this giveaway!!! Ohh, Moss trail is so pretty and just what I need for my living room. You may have just found what I was looking for! I'll have to check out their website. Number 5 is the one I'd pick, if forced to pick a favorite. I love the "Moss Trail" pattern. So perfect for spring! I like charcoal river the most! Number 4 is beautiful and would look awesome in my new living room! #1 - the green and yellow one would look perfect on my little one's bed! Charcoal River is my favourite, thanks for the giveaway, they are all very pretty! The moss trail is beautiful. Looks like it is the fave of almost everyone else too! These are great. I think Charcoal river would look great on my couches. Thanks! Oh, I love colorway #3. Beautiful! Oooh how lovely. I'd love to win #4 please (pretty please!). charcoal river is so so pretty. Thanks. Love charcoal river, they will look great in my bedroom! The Silver Trail is lovely! "Moss Trail" is my favorite! I LOVE 3, it is absolutely gorgeous! I love both Silver and Moss Trail! Gorgeous! I love them all, but I think I'd go w/ #4. What gorgeous goods! I'm captivated by neutrals right now, and opt for the Charcoal Birdseye pillows. But, oh, they're all so lovely. I really like the "moss birdseye"! I love the Moss Trail! Thanks for the giveaway. Oooo I LOVE 1) Moss Birdseye!!! Great pillows!!! These are very cool pillows. I like #1 the best. Thanks! These are all so pretty, but I think I like 'Moss Trail' (#4) the best! Oh! So hard to choose! I think Silver trail may edge out the others for me. It's so hard to choose a favorite! But I'd have to go with #4! 4) Moss Trail is just lovely! I love these. #4, especially! I love the moss trail. nice! I like #2, Charcoal Birdseye. I love love Sienna River #6!! I guess I would choose #2, but in all honesty I think they are all gorgeous. Beautiful! Great giveaway! I love the silver trail! I love the Moss Trail, but they are all gorgeous! So pretty! My favorite is #4. I had to confirm with my spouse first. Charcoal River would go great with our couch! I like Charcoal River. It would look great on my red couch! oo number 5 charcoal river would look GREAT in my apt! I would definitely choose Sienna River! Thanks for the giveaway! love the moss trail ones! I love moss birdseye! So pretty! Fabulous! I'm loving no 4: Moss trail! #4 Moss trail is great! Sienna River reminds me so much of the river near where we live. It's graphic and beautiful! I want one of those that go on the bed. But I guess I'd settle for "Sienna River". My favorite is the silver trail! I love the silver trail. Oh the silver trail is so beautiful.. ohhhh!! those are so beautiful!! i love the chalcoal river!!! wish me luck!! Yes please! :) I love Silver & Moss trail, both! I love love love number 5- charcoal river! Very cool pillows. I like number 3 best (silver trail). They are so modern but give the hint of nature. Pretty! I like the Charcoal River. They would look great on my black couch! I love the charcoal river! Beautiful! Cool! I like the moss birdseye. Silver Trail is so pretty! Love this blog btw... I am new here but have been reading your archives. Great stuff! Keep it coming! #1. thanks for the giveaway! #2. i would love to win the Moss Trail design!! I love them all, each and every one. Swoon!!! Ohh. Charcoal River! Love these patterns and colors. I like the Charcoal river. Pretty pillows! I like design #4. Totally matches my bedspread. Cheers! I like "moss trail," #4! Thanks! Beautiful! Love the moss trail! Those are lovely! I really like #5 Charcoal River. Great giveaway! I'm loving #6! They would look so great on my currently-pillowless couch!! I like #5 - Charcoal River! My choise is number 4>lovely giveaway. I like number one, Moss birdseye. I was coveting their Christmas tree skirts this year...but pillows would be soooo great! Definitely love moss trail - great look! lovely pillows!! #5 is my favorite! oooo...i love love love #3!!! I am coveting the moss trail design (number 4)! These are so beautiful! Oh, I love the "Moss Trail" design! Nature designs perfect for my bedroom! #4 would be so great! yeahhhhhhhhhhhhh this candy is beautifullllll.......... I like the n°4 ..... white and green !!! Thank you very much ..... so goooooddd !! A hug to Italy !! OOOOOHHHHH I would love silver mist. Thanks so much! Oh wow, these are fabulous!! I love Charcoal River, myself. Thanks for hosting such a great giveaway! Oh my, they're all beautiful, but I LOVE #6, Sienna River! They are all so beautiful, but I think the Moss Trail is my favorite! Ooh, I love Moss Trail! Moss trail is my favorite. Silver Trail would be perfect in my bedroom! I love #5 Charcoal River! All of them are speaking to me! The green ones would be perfect for the master bedroom, the gray for the living room, and the sienna for the guest room... very pretty. I like the bed frame, too. Oooh - moss trail (clearly a fave around here) would look amazing on my plum couches! I love Charcoal River! So pretty! I LOVE #5 (charcoal river) - thanks for hosting this! Number four is stunning! They are fabulous! I love it! Sweet and simple designs. I love the "moss trail". Thanks for sharing! Hallo, I like the pillows very much too. My favourite one is design Nr. 5! Beautiful! I love the moss trail! The Charcoal river is my favorite!! i LOVE the moss trail ! I have been looking for new pillows to liven up my sad, sad sofa... I'm diggin the Sienna river design! I love the "Silver Trail"! - Would look lovely in our bedroom. oh my gosh, moss trail is my FAVORITE. looooooove it! love them all... but the charcoal river ones would look just lovely on my new couch! number 4 is very nice! I love the whole Amenity's textile collection and love the fact that they are eco friendly too. My favorite pillow pattern is the Charcoal River pattern. They would look fabulous on my sofa! Charcoal river looks very snazzy. I can totally picture myself lying my head on the Silver trail!!!!!!!!!! i love the charcoal river one! I love the moss trail! I love them all, but The moss Trail (#4) is my favorite. I love the green! love the moss trail (#4) design! They are gorgeus! I love the moss birdseye, I'd pick that one. Charcoal River for me -- lovely! thank you! Just one! Haha! Well I would choose #5. Thanks for the giveaway! The Moss Trail pillows say "spring" ! Very nice pillows! I really like #5 (Charcoal River). It's so refreshing to see something so organic and vivid! I'm truly a fan of their textiles! I love the greens this year! Especially Moss trail - gorgeous! I really covet the Muir bed! 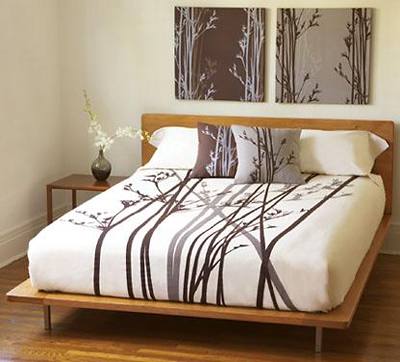 I have a danish modern bed with the nightstands attached, but I'm a little sick of it. I would prefer a platform so I don't have to try to lift the mattress out of the box edges to tuck the sheets in! However, since my bed is a Cal King, I can't really afford the $2100 right now! I would be more that happy to settle for the pillows, though. I love number 5. Love the 'Moss trail' pillow!! What a beautiful giveaway. I would love a set of the Charcoal Birdseye pillows. They'll look amazing on my couch. OH! Love the Sienna River! It would look great with my mom's new living room that we are working on! 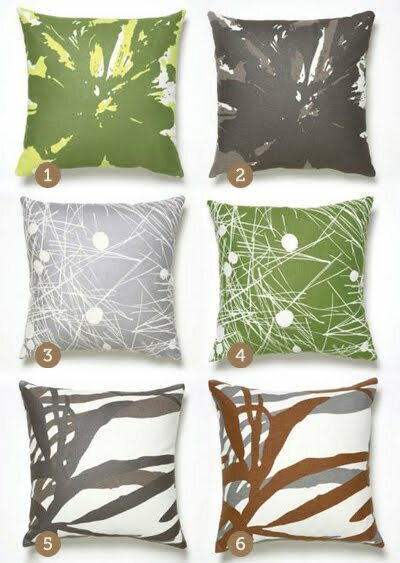 I love the Moss Trail pillow - they would look amazing in my living room! wink wink. I especially love #5 Charcoal River. Goes perfectly with my new couch cover!